Zebulon Strong built two houses, one brick at 5434 Hamilton Avenue and the one that is now Six Acres Bed & Breakfast at 5340 Hamilton Avenue. 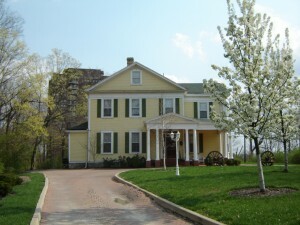 The brick house was surrounded by a large orchard and was used as a safe house. Six Acres, The wooden house, contains several hiding places that can be seen today. The escaping slaves would come up the ravine, from where the old railroad line was later located and hide in the piles of brush in the gulley under some old burlap sacks. The Strong children would play in this area, casually leaving behind food. After dark, Strong would conceal the slaves in his wagon, which had a false bottom, and would take them out Belmont Avenue to the next station, a brick house at the corner of Colerain and Springdale Roads. Zebulon Strong was a half-brother of William Cary.